I didn’t expect to be wet and cold in Israel. Yet here I was in a sacred church in Jerusalem during a downpour, huddled behind massive wood-paneled doors to buffer against biting wind and freezing-cold rain that needles my skin. This isn’t the plan. I’m supposed to be hiking. I came to Israel to sample the Israel National Trail, a 620-mile route that traverses the country from north to south. 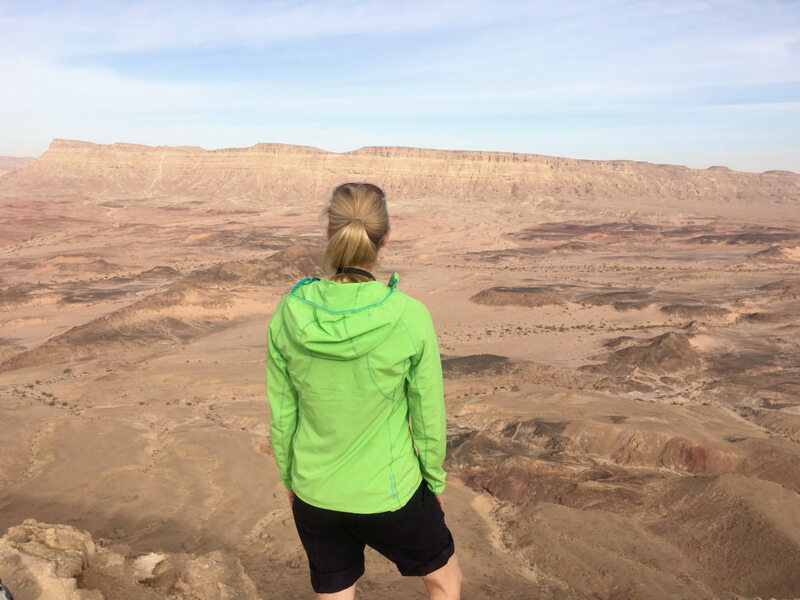 Picturing sunny Middle Eastern skies and dry desert, I packed lightly for days on the trail, failing to note that 43 inches of rain drench northern Israel each year, most of it falling in a few months. My trip spans late November and early December, right when the wet season kicks in. I should have brought an ark. The day I arrive in Jerusalem, Biblical rains prompt the newspaper to exclaim, "Flooding, road closures as heavy rain pounds Israel." My guide, Dovev Peèr, cancels one hike, then another as lightning flashes across the sky and thunder trembles the earth. A former paratrooper in the Israeli army, Dovev is a fit Israeli man with a broad, toothy smile and a bow-legged gait. He has been a certified guide for 14 years and possesses an encyclopedic knowledge of everything from ancient history and religion to rock formations, agriculture, and wildlife. Given the weather, he changes our plans to focus more on culture and less on nature for a few days. When I find out this means a lot of churches, I’m somewhat miffed. 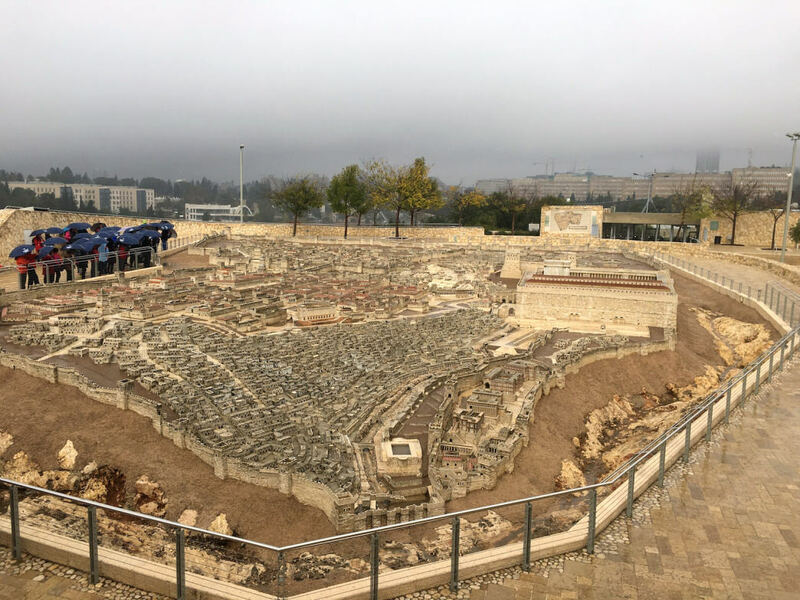 Although many people do, I hadn’t come to Israel for religious tourism. I had come to experience the trail. Walking through the city feels like a test of endurance. My light raingear resists for a little while before giving up, water drilling through its feeble fibers. Clothes and hair soaked, I squish down cobblestone alleys to the Church of the Holy Sepulchre, the holiest church in the world. I’m unprepared for the divinity inside the unassuming, honey-tinted stone sanctum, which is said to be on the site where Jesus was crucified. 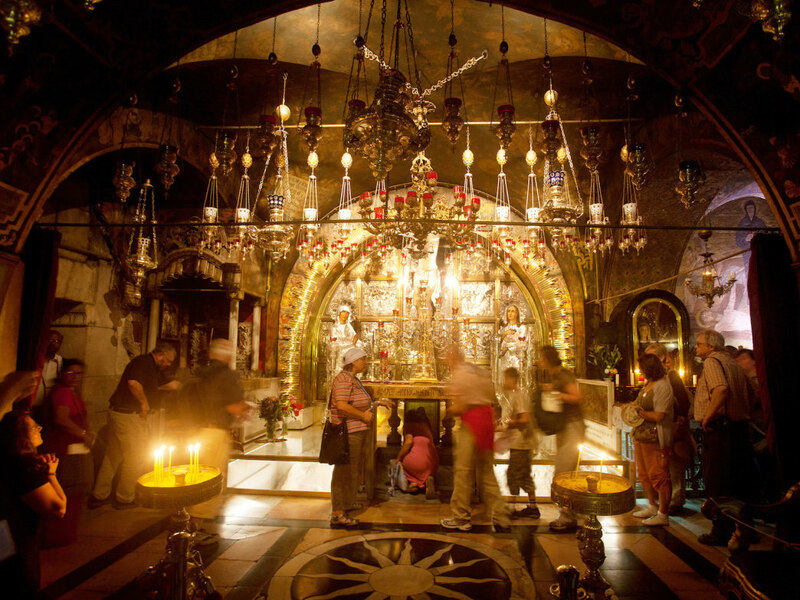 I enter on blind faith, make a sharp right, and follow the throngs, shuffling up well-worn stairs to a dimly lit second floor chapel, where devout pilgrims take turns kneeling at a small, low window that frames the Rock of the Calvary—the site where Jesus’ cross was raised. I feel a divine presence seeping from the walls. Even though I’m not religious, I sense the spirituality. The Holy Land is piquing my curiosity. Why do deep-seated beliefs seem to spawn such conflict around here? Under a huge arched window on the second story of the Church of the Holy Sepulchre, a rickety wooden ladder rests on a ledge, having been in the same spot for more than 200 years. Six denominations share the church, and all six must agree on changes. The ladder is a sticking point, and so it just stays. As I leave the building, I glance up at the ladder and angry clouds overhead. A classic blues lyric drifts into my thoughts: "The sky is crying." I shrink in my wet jacket and brace for another storm. Tucked into a nook along Palestine’s West Bank, Jerusalem is inseparable from religion and politics. Israel controls the city and claims Jerusalem as its capital, which the United Nations doesn’t recognize. Palestine says its capital is East Jerusalem, land that Israel has occupied since a 1967 war. 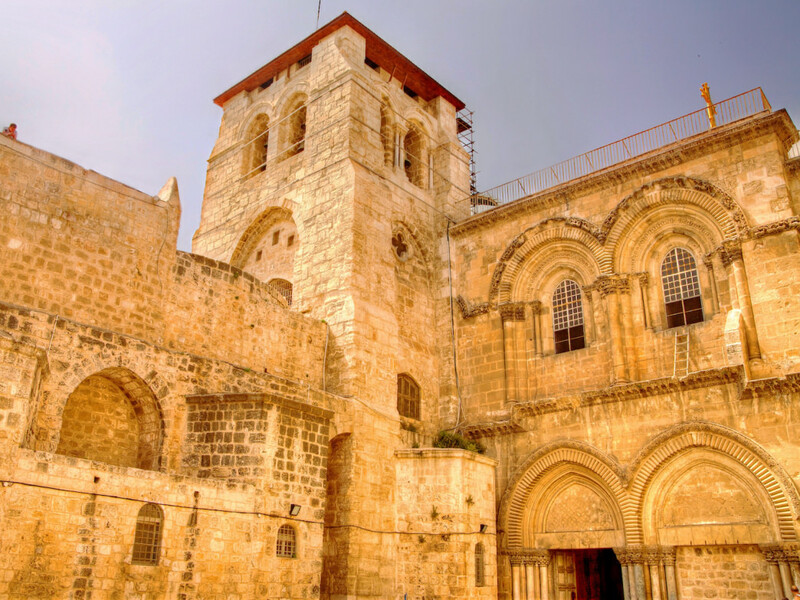 The city is the heart of the Holy Land, sacred to Christians, Jews, and Muslims. In eastern Jerusalem, the Temple Mount (the Haram Ash-Sharif, or Noble Sanctuary, to Muslims) is a source of bitter contention among Jews and Arabs. 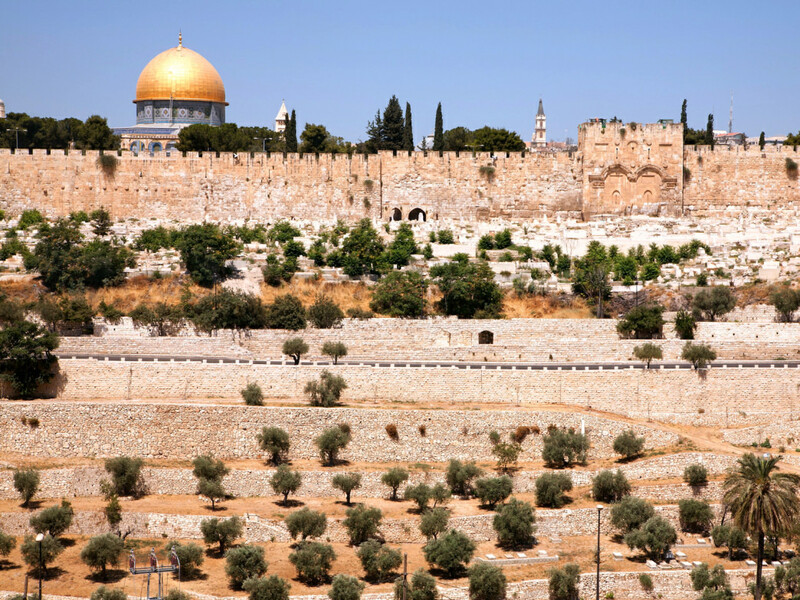 On the hilltop, an Islamic shrine, the Dome of the Rock, caps a sacred stone—the holiest site in Judaism and the third holiest site in Islam. Muslims control the hill, so Jewish pilgrims say their prayers nearby at the Western Wall, the remnants of a structure built 2,000 years ago to prop up the Temple Mount. Walking around the Old City of Jerusalem, Dovev tell stories about the human drama that has played on this stage for thousands of years. Rain tries to wash away the fingerprints of all the hands that have grasped at these walls, yet the streets echo with chaotic footsteps. I can’t begin to decipher the complex turf wars here. Back in the warmth of my hotel lobby, I order a glass of Israeli red wine and sit in the lounge, watching the twinkling lights of the city as the sky’s tears splatter against the windows in long streaks. Nothing about Israel is straightforward. You can’t measure the country’s size, name its capital, count the miles along its Mediterranean shore, or refer to a sacred hill in Jerusalem without taking sides. Even cherry tomatoes spark controversy. Cherry tomatoes. Some say Israel invented them. Others contest this claim. The clouds part the next day as I leave for the Negev Desert—a parched, sandy landscape that spans the southern half of Israel. 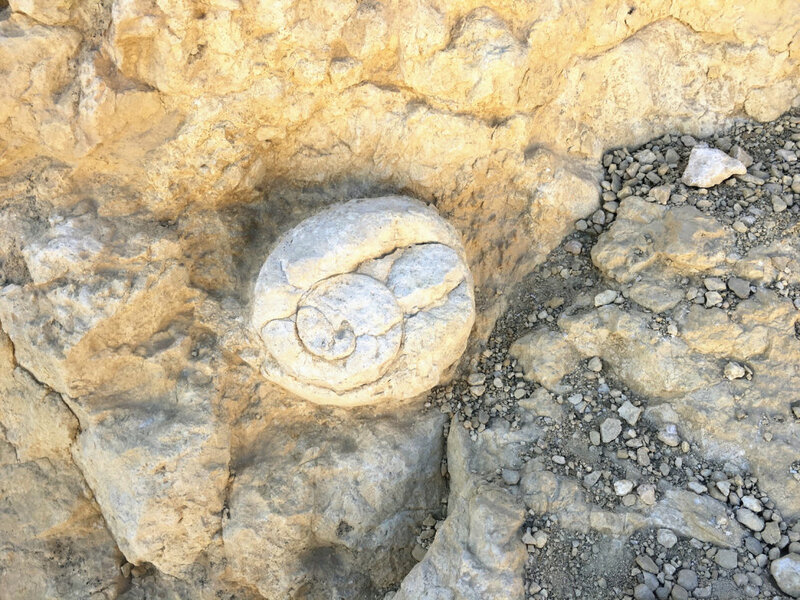 The scenery conjures up images of the moon as the road winds over rocky ridges, along chalky cliffs, through boulder fields, and past the salty, turquoise waters of the Dead Sea. 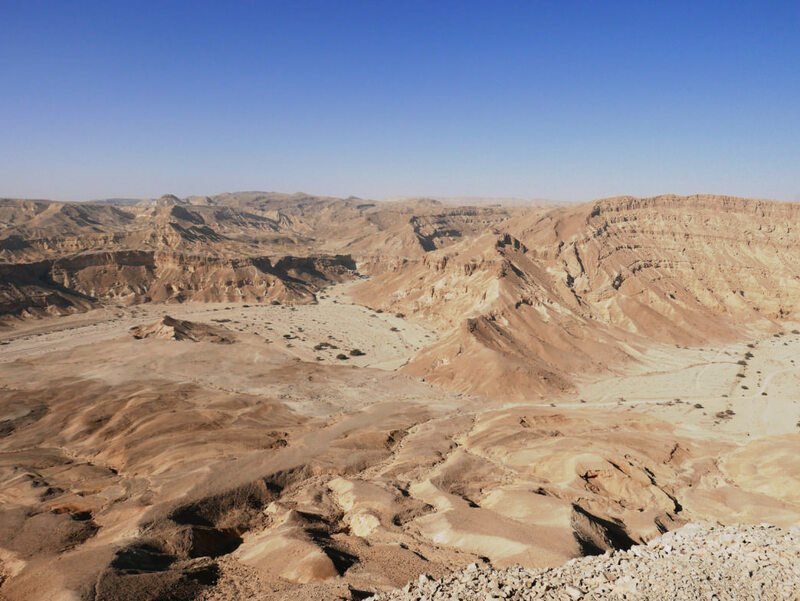 We head for a trailhead near Makhtesh HaKatan, one of three giant craters that pock the Negev Desert. 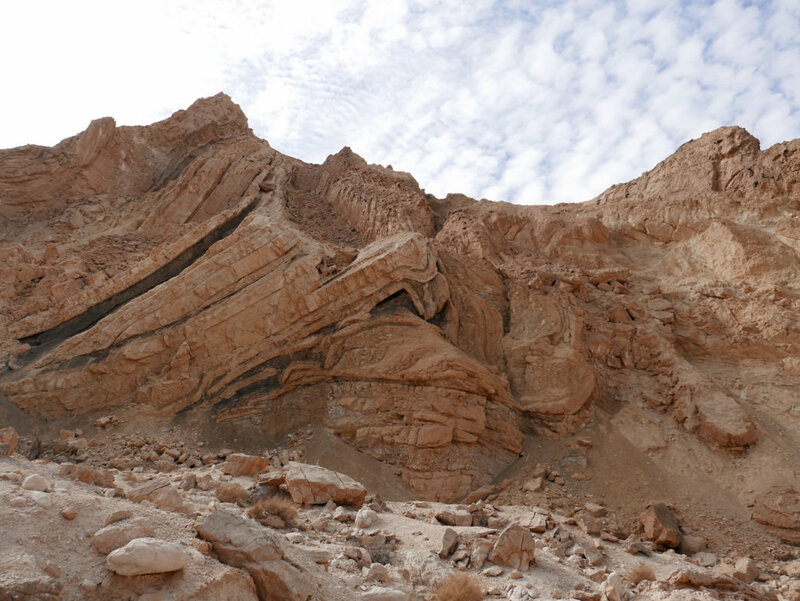 These erosion cirques, each drained by a single stream, range in size from the 25-mile-wide Makhtesh Ramon, to the small crater—Makhtesh HaKatan, which spans 4 miles. "At the top of the crater, you look 500 meters deep through 200-million-year-old layers where dinosaurs walked," explains Dovev. I’m finally hiking on the Israel National Trail, happy to be free from the tangled web of the city. My boots crunch against tan sand as the sun pulls sweat beads out of my neck. A few hardy shrubs poke out of the dry riverbed. I study the rocks that rim the trail, with tilted layers that represent millions of years. We’re walking through a library of time, where every stone tells a story. Huge cliffs rise in the distance, forming the crater’s edge. The trail steepens, scrambling up ledges as the massive crater falls below us. After a stout climb we crest the limestone cap on the rim. My eyes sweep across the vast desert, taking in the present moment. A starling flits across the cloudless blue sky. The sun casts a shadow unique to this day. Wind kicks up swirling dust. Then I soften my gaze to take in the full scene, and my perspective shifts. In the desert, among rocks that have melded over billions of years, modern worries and time seem to fade. The crumbling cliffs become the clock’s creeping hands, with people and their immovable ladders just a tiny blip in history. We are just visitors here. Someday our tracks might harden into fossils, or they might erode into the sand. I came to Israel seeking outdoor adventure. I walked away with a newfound appreciation for the Holy Land.